Last Wednesday was a pretty average day for Madison Langer. That is, until the Ridgefield High School senior got a call from her mom during class saying “I’m so proud of you.” Langer said thanks but then asked her mom — proud of me for what? Her mom broke the news: The state Legislature had just passed a bill that raises the age to buy tobacco and vaping products, a bill that Langer spent two years supporting. Langer joined Gov. 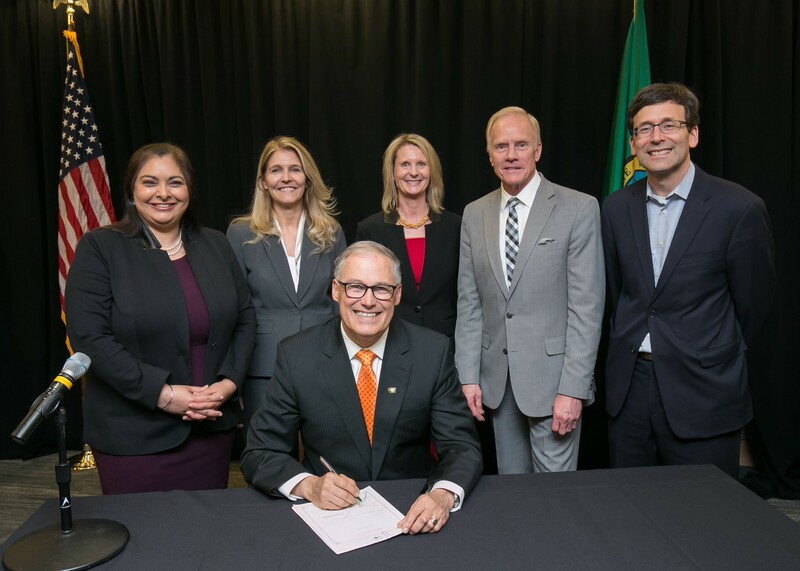 Jay Inslee, Attorney General Bob Ferguson, dozens of students, legislators and local health leaders as Inslee signed the bill into law Friday at the Fred Hutchinson Cancer Research Center in Seattle. The bill raises the legal minimum age for tobacco purchases from 18 to 21. The Senate passed the bipartisan bill last Wednesday, which goes into effect Jan. 1, 2020. Ferguson said the Legislature is saving thousands of Washingtonians from a lifetime of addiction and smoking-related illness through this bill. Rep. Paul Harris, the bill’s primary sponsor in the House, said he’s been concerned for years about the amount of tobacco-related products on school campuses and how accessible they are to youth. 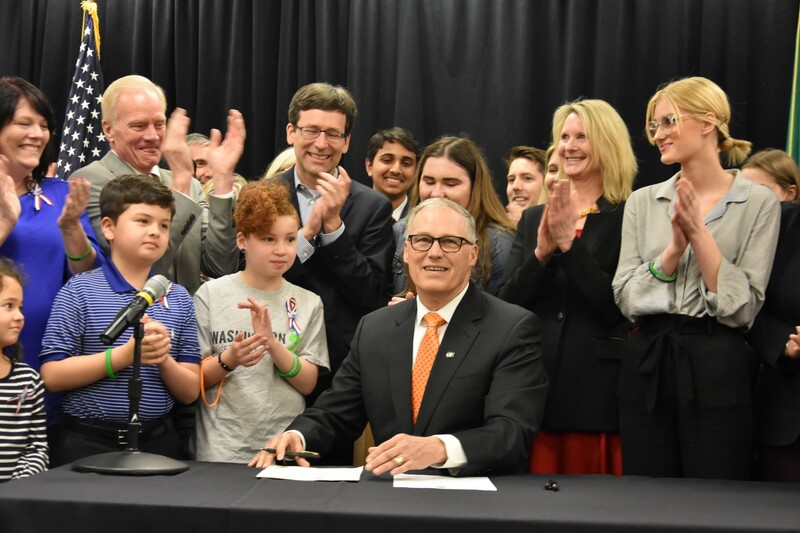 John Wiesman, Washington State Department of Health secretary, said the new law will make a significant difference in the health of young adults. To 17-year-old Langer, this bill is personal. She volunteers as a national youth ambassador for Tobacco Free Kids and even testified in support of the bill earlier this year. But what makes the bill especially meaningful is that she’s a former drug and tobacco user. At age 15, Langer said someone offered her a Cap’n Crunch-flavored vaping device. It didn’t look like anything she had seen before — and it definitely didn’t look like a cigarette — so what was the harm? From the first day she took a hit, Langer said it was a “no-brainer” to use the device whenever it was around. She didn’t think the product would cause that much harm. But Langer’s vaping use changed the way she thought about substances and she eventually found herself using drugs, too. When she decided she wanted to get clean, it was tough to get sober around her then-current group of friends. On top of finishing high school, Langer currently works at an educational service district in Vancouver as a tobacco prevention assistant. Eventually, she wants to work for a marketing agency on social change issues. She now feels like she — and public policy — are moving in the right direction. The new law affects the 15- to 18-year-old age group the most. That’s because among adults who become daily smokers, about 90 percent report they first used cigarettes before they were 19, according to a 2012 Surgeon General’s report. Dr. Jonathan Bricker, a smoking cessation researcher at Fred Hutch, said almost all the patients he had treated for nicotine addiction first used tobacco as a minor. The report also states that close to 100 percent report using their first cigarette before the age of 26. That’s the main reason this bill could be a game changer: An Institute of Medicine report estimates a 15 to 25 percent decrease in tobacco initiation rates for teenagers when the legal age for use is 21. Sen. Patty Kuderer, primary sponsor of the bill in the Senate, said this new law will save lives. Among people who aren’t smoking by age 21, 95 percent will never start, according to that 2012 Surgeon General’s report. 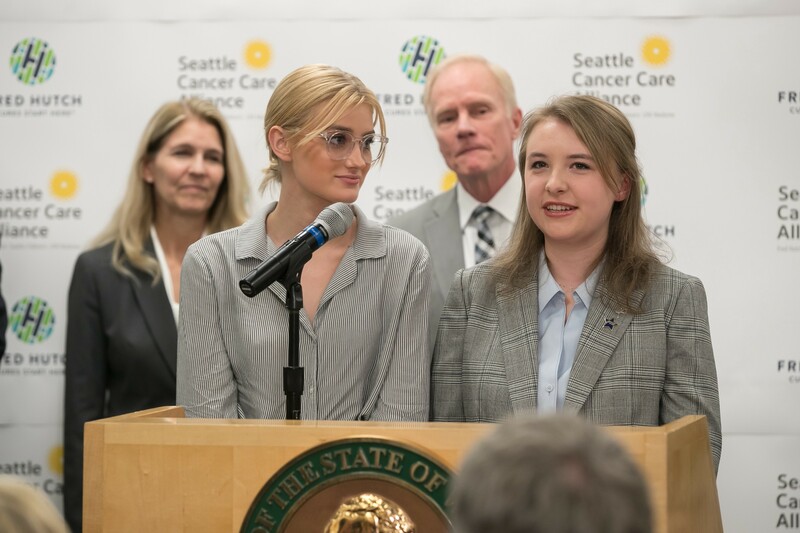 Keith Eaton, clinical director of thoracic, head and neck cancer at Seattle Cancer Care Alliance said Tobacco 21 is a common sense approach that ensures a healthier future for young Washingtonians. Scott Seaman, executive director at the Association of Washington School Principals, said vaping happens in class, hallways and especially in school bathrooms. Many schools now go to great lengths to patrol restrooms and many students are scared to enter them because of the number of students vaping there. While vaping interferes with learning and contributes to poor health issues, Seaman said something deeper may be going on with students who vape. It’s why he said this issue shouldn’t be treated as a discipline issue but rather as a mental health crisis. With the new bill in place, Seaman said school officials can take back their schools and help students take back their bathrooms. While it may be hard to enforce at first as administrators clamp down, he said the bill was the right move. Like Langer, high school senior Cami Brix also testified in support of the bill. 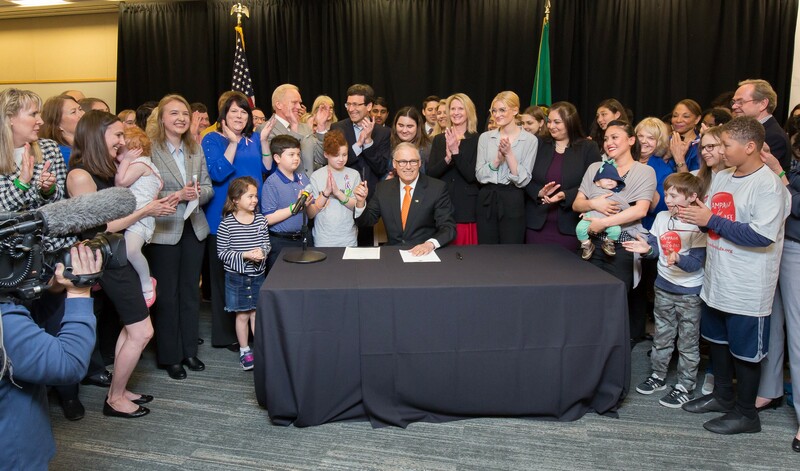 Brix became involved in tobacco prevention through her work as a student representative of Inglemoor High School’s Parent Teacher Student Association and Tobacco Free Kids. Brix said many of her friends who vape have a hard time focusing in class. Students vape in the back of classrooms and she has experienced school restrooms closing because of student vaping. One friend shakes because he needs to vape at least once an hour. She said it’s scary to watch her friends go through the experience. So she used her platform within PTSA to fight the widespread trend. “It’s one of those epidemics that has touched every social group and it’s why this bill is so important,” Brix said. Nick Fradkin at the Department of Health said an adolescent brain is more vulnerable to nicotine addiction because the regions that control impulses, decision making and sensation seeking develop and change until the age of 25 or 26. 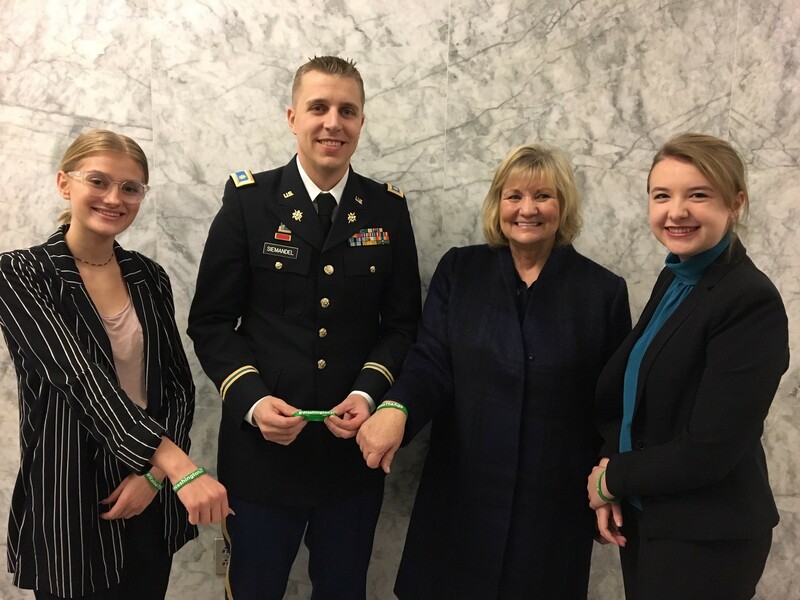 Madison Langer (left) and Cami Brix (right) stand with Trudi Inslee after testifying in support of the Tobacco 21 bill earlier this year. Fradkin is the department’s interim program manager for Tobacco and Vapor Product Prevention and Control. He said teenagers often rely on their social network, such as an 18-year-old senior or an older sibling, to get access to tobacco and vaping products. Prevention efforts are targeted to vaping products because the industry has grown so much. Julie Peterson, senior director of policy at the Foundation for Healthy Generations, said the 2018 Washington Healthy Youth Survey shows the dramatic rise of vape use among youth in just two years. 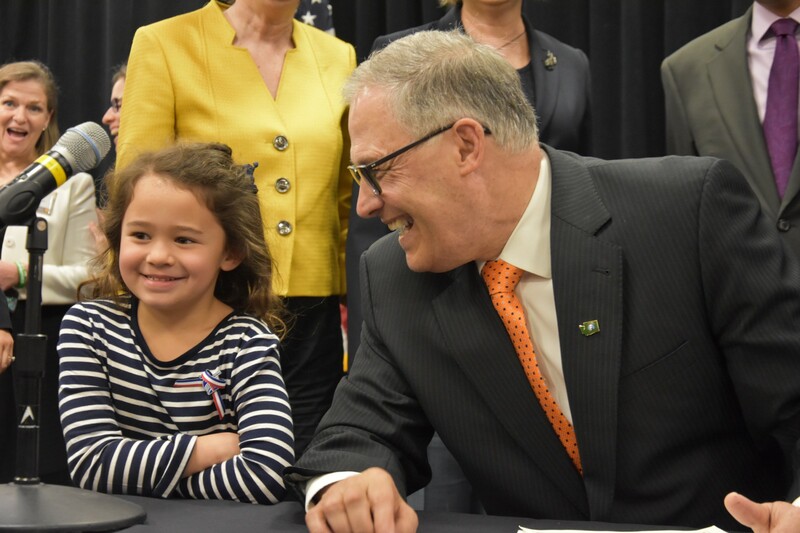 Inslee said Washington joins more than 400 cities have raised the purchasing age for these products. Telephone counseling: Call 1–800–QUIT–NOW to quit tobacco and/or vapor products. To quit vapor products, text “QUIT” to 202–804–9884, courtesy of Truth Initiative. To quit tobacco products, text “TEEN” to 47848 to access SmokefreeTeen. For more Healthy Youth Survey fact sheets and reports, visit AskHYS.net.